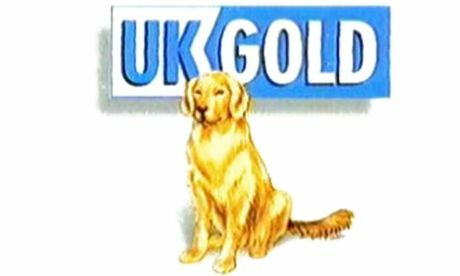 25 years ago, we saw the launch of UK Gold, a free-to-air satellite channel showing classic BBC and Thames TV shows. If we look forward to November 2042, what will we see? Trying to predict the future is a mug’s game. But increasingly it’s a game we all have to play … because we are going to have to live there, probably next week.” - Douglas Adams. The above graph is coloured to match the current age bands provided by TV regulator Ofcom (collected by BARB, who measure TV audiences). Given the attractions to people today of spending time watching everything from games consoles and PCs to YouTube, Netflix and Amazon Prime, we can predict using the trends since 2010 as to how much “television” people will be watching in the future. 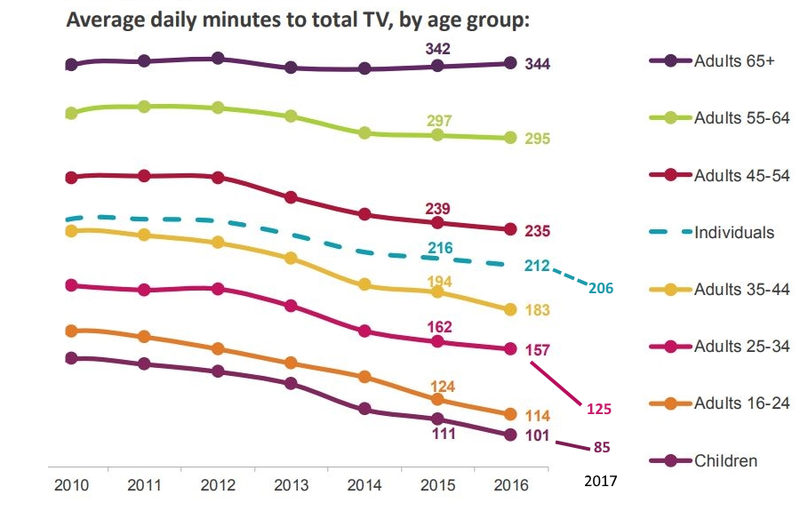 The current trends have current under 24 years olds abandoning TV altogether by 2027, and those between 25 and 44 giving up on television by 2035. The good news, is that those over 45 will still be watching good old television, if current trends continue. If we look at the trends for watching TV by 2042, the Licence Fee income will drop the current £4 billion a year income to just £353 million (at current prices) as only those over retirement age will still be watching live TV. This means there will still be 6.4 million UK homes with a television (many more will have a screen used for watching video content). If those aged 75 and over get a free licence, so the BBC’s Licence Fees from live TVs would be paid for by just 2.4 million homes. So, an important question here in the future is how well has filling the “iPlayer loophole” (no licence was required just to watch BBC shows online) worked out? How many of the remaining 23.7 million households will be still paying their £150 to the BBC? The "iPlayer loophole", recently closed, was said by TV Licensing to be used by only 2% of households at the time. It is certainly clear from the above data to see that the long-term survival of the BBC clearly put the need to pay for online viewing ahead of the losses for free licences for those ages 75 and over. Will satellite TV still be a thing? In practice, the cost of sending satellites up into space to transmit television has always required a base of subscribers paying for the service. As the satellites last around a decade each, there has to be an ongoing profitable television business to keep launching replacements. One problem is that the quarter of a second it takes to bounce a signal off a geostationary satellite makes them a poor choice for interactive internet use, and it is significantly cheaper to use Earth-based system for streaming TV. The economics of free-to-air transmission will no doubt mean that Freeview will only continue from a limited number of larger transmission towers (Crystal Palace, Emley Moor) with repeater masts being converted to a 5G data service. Let’s hope there will still be a low-cost or no-cost way of watching some TV in these places. So, what do you think? Tell me in the comments below. MikeB: The long wave transmitter for RTE Radio 1 including opt outs was DRM enabled some years ago for overnight testing! Unfortunately, DRM broadcasting did not cut the mustard in Europe with Bluetooth/WiFi enabled digital radio stealing the DRM buttered scone and jam! A lot depends on how far the rollout of fibre-based internet goes. It will need to reach every home and premesis in the country so that everyone can get the TV-style of information, news and entertainment. At present large swathes cannot get a good enough internet connection for streaming of HD programming, let alone UHD! Even some urban areas don't get the speeds needed for HD downloads and many rual areas are just as badly served. Until such time as the whole country, meaning everywhere that people live and work, can access fast enough broadband then we will still need to use RF broadcasting to deliver the information and entertainment they want. MikeP: and you have to think about bandwidth. Just the other week, while working one evening, we tried to get one of the display TVs at work to stream one of the world cup matches in 4K via Iplayer. And it stuttered so much we gave up. The reason wasnt the TV or even the broadband/wifi within the building, but simply the number of people who were trying to do the same thing around the country. I reckon 5G wireless broadband is the real future for television and radio carriage! It could be good news for the aerial industry during 5G's pioneering years with customers demand beyond the initial 5G reception areas! A bit like the early colour television era when high gain aerials with amplifiers were attached, high up and well above the chimney pots on many a roof in fringe reception areas! Sadly for the terrestrial TV companies Sky was given far too much of a head start. The same has applied to Netflix and Amazon. The problem is that there are now so many channels trying to provide entertainment that there are not enough new programmes being made to fill the available time. Hence so many repeats and American sourced output (that not everyone likes). There are no government restrictions on what they broadcast apart from those to do with the content being legal, etc. The BBC and ITV companies have been broadcasting since the fifties (BBC 1 since 1952, ITV since 1954 [depending on area] and BBC2 since 1964. Channel 4 cam along in the early '80's and was afollowed later by Channel 5. Sky didn't start broadcasting until the first Astra satellite was launched in 1989, so came later than the BBC and ITV services. The big problem for most broadcasters is finding enough programmes suitable for their audiences at a price they can afford and that they want to broadcast. I think the comment from Nik above may have been about perceived regulations in the U.K.? high rents and Amazon etc. broadcasters for traditional T.V. either. Innovation across all forms of media seems to be a thing of the past and is now effectively dead. "5G will have replaced Freeview Light at repeater sites." Then many will replace the TV licence fee with not paying the licence fee. 5G is not intended to replace Freeview at all, they will be using a completely different part of the frequency spectrum. Freeview will use that beloew 700 MHz and 5G that above 700 MHz (with a few exceptions). Thus Freeview light will not be affected at all. The TV Licence does not depend on 5G of Freeview but whether you are watching any 'live' programmings from any broadcast source, that includes Freeview, Freesat, Sky, etc.